Visible crew/equipment: When Robert De Niro goes to meet Joe Pesci in the desert, the whole crew is reflected on the side of the car. Continuity mistake: Sharon Stone repeatedly smashes her car into De Niro's in the driveway, yet if you look closely in the shots as she gets out of the car, there is no damage to the front of her car, not even a broken headlight or glass on the driveway. Continuity mistake: When Joe Pesci is beaten and then buried - look at the blood on his chest. In one shot it is all over - the next it is just a smaller patch. Continuity mistake: When Remo Gaggi is talking to Andy Stone about Ace cussing out the Board, there's a pack of cigarettes beside Gaggi in his car. 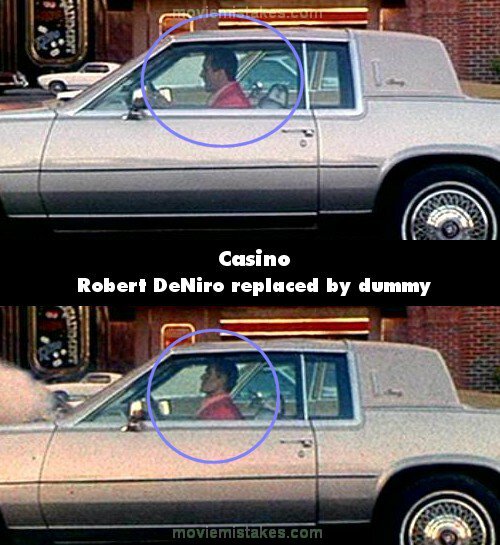 The camera angle changes to show Stone's face, who is outside the car, and when it flips back to Gaggi, there is a Zippo lighter in place of the cigarettes. The camera goes back to Stone, and when it comes back again, the Zippo is gone and the cigarettes are back. And to top it all off, not once did Remo smoke in this scene. Continuity mistake: When Joe Pesci is stabbing the guy with a pen that insulted Ace, the pen is shown without blood after there was significant blood on it the cut before, then it goes back to having blood on it. Continuity mistake: When Ace fires Don Ward, the shot is on Ace and you can see Don turn away. When the shot changes to Don, you see him turn away again. Continuity mistake: When Robert De Niro is at the restaurant with Sharon Stone and catches her with James Woods, the menu under his hands goes from being horizontal to vertical. Continuity mistake: When Artie Viscano is complaining to his brother in law about Las Vegas, he backs into about 10 bottles. They all fall except for two, and then the scene cuts to to his brother in law and when the scene cuts back to Viscano, all the bottles are back up. Visible crew/equipment: In the scene where DeNiro is throwing Sharon Stone's character out of the house after overhearing her on the telephone, he drags her into the bedroom. Just before the scene cuts away, the camera appears in the mirror on the wall behind them. Factual error: In the jewelry robbery montage, Joe Pesci is shown holding a rechargeable Mag-Lite flashlight which would not have been available at that time. 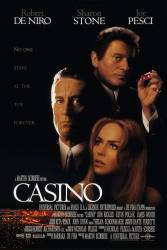 Audio problem: In the scene where Sharon Stone is talking to Joe Pesci about how De Niro had his guys beat up James Woods, at one point Sharon Stone says, "Oh C'mon." If you look closely her mouth doesn't move at all. Also if you listen closely, that line comes out on surround sound. When she continues her line it comes out on mono. It was obviously recorded.